Chuck Todd spoke about today's political climate and civil discourse at a packed event in Jack Morton Auditorium Saturday. Updated: Oct. 23, 2017 at 1:18 a.m. 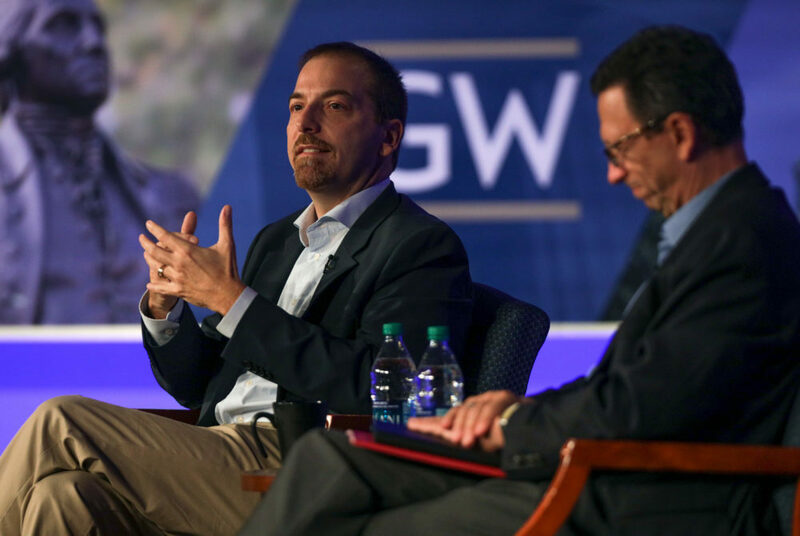 The GW College Democrats and College Republicans co-hosted political journalist Chuck Todd in Jack Morton Auditorium Saturday for a wide-ranging conversation about civil discourse, the political climate and safe spaces. More than 200 alumni, parents, students and members of the School of Media and Public Affairs’ National Council packed the auditorium for a discussion moderated by SMPA Director Frank Sesno. The event was a featured element of Colonials Weekend. Hunter Wilson, the vice chair of the College Republicans, and Jazmin Kay, the president of the College Democrats, introduced Todd before he took the stage. “He zeroes in on what is happening in Washington and why it matters,” Kay said. Sesno started the chat talking about the importance of challenging different political viewpoints both on campus and in the news. Todd, who hosts the weekly political talk show “Meet the Press” and studied at GW in the 1990s, said he aims to make his show more accessible for audiences at large. Sesno then turned the conversation to the newsmaking process and what news means for the public today. Todd said America’s new leadership is defying political convention, something the media must adapt and react to quickly. Todd then fielded audience questions about safe spaces, trust in the press, feelings versus facts and local and national news. Hannah Kelman, a freshman, asked Todd about his take on safe spaces on college campuses. “I know it’s well-intentioned, but in all honestly, I think it’s bad – bad for our country,” Todd said as the audience erupted in applause. Sesno said a balance between being sensitive and holding a robust intellectual debate is something GW’s leadership grapples with every day. A quote attributed to Jazmin Kay has been updated to accurately reflect Kay’s statement at the event.